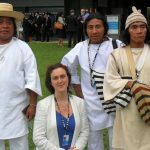 In June 2012 The Rio+20 Sustainable Development Summit attracted politicians, scientists, civil society and representatives of indigenous people from around the world. It was a good opportunity for Mountain Partnership members to assemble and discuss important issues, problems and solutions. 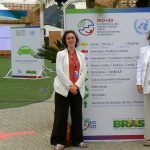 This was the Third Global Mountain Partnership Summit and was located in the RIO+20 Mountain Pavilion, hosted by the Peruvian government. in Athletes Park. During the event we displayed an exhibition titled ‘Our World, Our Water and Our Responsibility’ in the Pavilion and became panellists with Michael H Glantz, Director of Consortium for Capacity Building, University of Colorado who chaired a discussion on his H2O initiative. The Mountain Partnership is a United Nations voluntary alliance coordinated by the FAO. Its purpose is to bring members together to work towards a common goal for improving the lives of mountain people and protecting mountain environments around the world. The Mountain Partnership has over 200 members from governments, intergovernmental organizations, civil society and the private sector. The Summit was a good chance for us to meet with some of the other members and share views During this Summit we were able to emphasise that mountain glaciers, forests and ecosystems are not merely an important topic for those dwelling in mountainous regions but that they are highly significant for the whole world. We felt that it was important to pinpoint the critical role that mountain ecosystems play in global climatic stability, freshwater regulation and the global water cycle. We highlighted that with this point being given greater emphasis the case for the protection and regeneration of mountain regions would be much stronger.